Everyone and their Auntie had Degenkolb and Sagan as favourites for today’s stage and though their respective teams worked hard at the front throughout the day, the key to today’s victory really did come down to position in the tricky last 5km. With two roundabouts and two nasty turns to negotiate, the last just before the final 650m uphill kick, it was vital to be in the front ten places for a chance at victory. Sagan was in a great position as they hit the last climb, but just didn’t have the legs after yesterday’s exploits. Orica-GreenEDGE dominated the front under Matt Hayman‘s watchful eye and last man Mitch Docker delivered Ewan perfectly. As a furiously nodding Degs wound up his sprint, Ewan hopped onto his wheel and then swooped past him in the last 50m to take a sweet win. 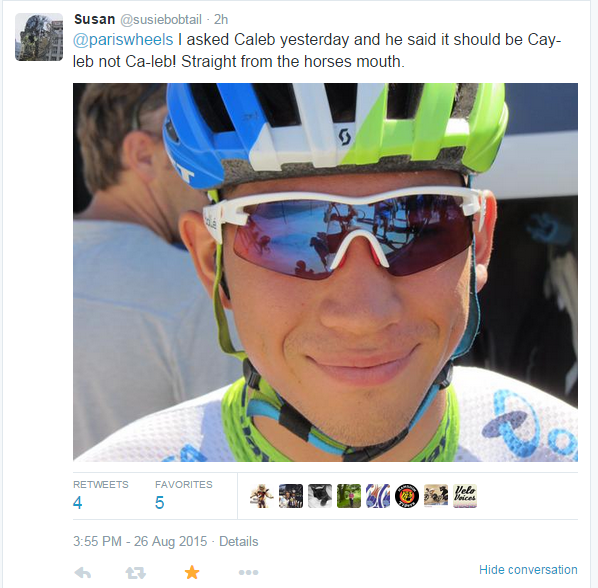 It can’t be anyone other than Caleb Ewan. The arrival of the 21-year-old Aussie sprint tyro into the pro peloton this year was hugely anticipated, and he’s more than lived up to the hype with nine stage wins so far this season. Yes, they may have been at smaller races but that’s what is brilliant about Orica and their management of young talent. For a young rider who is used to winning, it must be easy to lose confidence when the victory salutes suddenly run out. But let them race, let them win and then when they’re ready and brimming with the stuff – bring them to bigger races and watch them fly. It’s an incredible feeling. This is by far the biggest victory of my career. When I crossed the line there was so much emotion, I was so happy. It means a lot to me to beat two of the best sprinters in the world and that finish really suited them and they’re strong. I knew it would be tough to beat them but I felt good and my team did an awesome job and delivered me perfectly. Oh, and in case anyone was wondering, it is pronounced Cay-leb. 1 New man in red It’s been a day of conflicting emotions for Orica-GreenEDGE and Giant-Alpecin. The Australian team took the stage win but lost the overall, while the Giants had to settle for second place on the stage but go home with the maillot rojo on the shoulders of Dumoulin. There was also a slight wibble here at VeloVoices Towers at the thought of no more post-stage interviews with the very smiley and talented Esteban Chaves, but then we remembered what a fine rider Tom Dumoulin is and how brilliant it is that both have been in the red this week. 2 Don’t mess about with Iljo Keisse Giro stage winner Iljo Keisse (Etixx-Quickstep) got himself into the break of the day along with Tsgabu Grmay (Lampre-Merida) and Europcar’s Antoine Duchesne. As they approached the intermediate sprint with 25km to go, Duchesne attacked and the Eritrean Grmay started shaking his head and refusing to come through to help in the chase. Iljo looked distinctly displeased with this and was even more unhappy when the Lampre rider made a go for the sprint! Keisse waited for his moment, swung left, and then pounced to take the sprint before carrying on with a solo raid that wasn’t caught until 9km from the finish. Keisse was awarded the combativity prize for the day, while Grmay was last man home. Fantastic win by Caleb Ewan, his first Grand Tour stage win and only 21 years old! He’s a little bobby dazzler… showed all the right signs at Tour of Poland and secures the win here. Going to be a thrill to see how far (and fast) he can go over the next years.